THIS IS A NON SMOKING UNIT. NO SMOKING OR VAPING IS ALLOWED AT ANY TIME IN THE TOWNHOUSE, THE GARAGE OR LANAI. 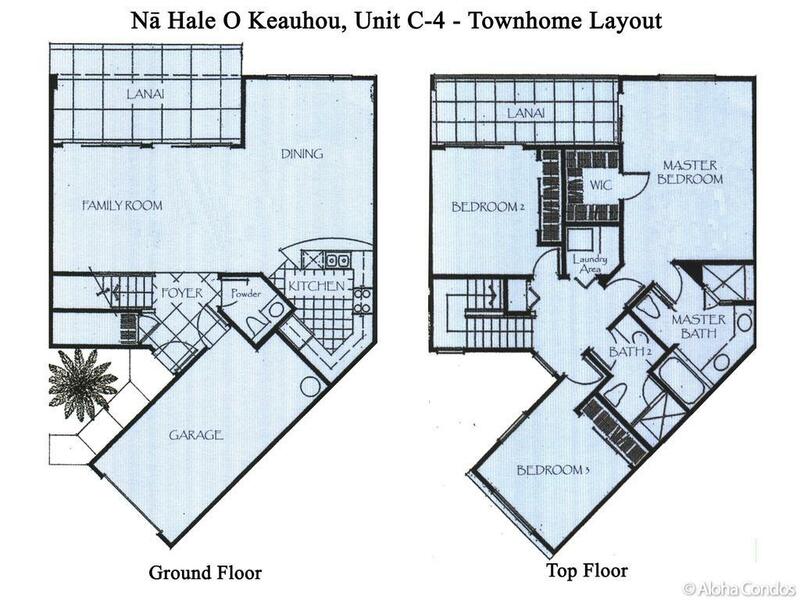 Na Hale O Keauhou is a condominium association with many full time residents and as such enforces House Rules to maintain a very high standard that helps makes this such a desirable place to live and visit. Owners and vacation rental guests are required to follow these rules and are subject to fines for violation of the rules. A list of these rules are posted inside the condo at the pool. *A $750 security deposit authorization is required with this reservation and we will process a credit card authorization in that amount 7 days prior to your arrival. A charge may result for damage to the condo or contents, loss of the pool smart key, missing contents, excessive cleaning required after checkout or for exceeding the maximum number of overnight guests. *We allow a maximum of 6 overnight guests. With more than 4 guests, a $15 fee per additional guest is charged per day. Falsely representing less guests than are actually staying will result in loss of all deposits and immediate eviction. *Full payment of the rental balance due is required no later than 30 days prior to the check-in date. *Cancellation made within 30 days of the check-in date results in loss of all payments. *Check-in time is 3 PM and check-out time is 11 AM. Please be certain to plan your arrival and departures times accordingly. An early check-in time or a late check-out time may be available and is subject to a fee. Please contact Stephanie for more details. Central air conditioning is available at a rate of $20.00 per day. Air conditioning is required from June 1st through October 31st and is optional for all other dates. Guests must indicate at the time of their reservation regarding their use of A/C as they will be billed in advance. Notifying the owner after the reservation is in progress that the guest does not care to use the air conditioning will not result in a credit. The Association prohibits business use stays on the property. This includes work vehicles, work crews and so on. This Unit is to be used for VACATION RENTAL purposes only. Please contact the owner for clarification on this condominium rule if there are questions. Guests who are found to misrepresent their purpose for renting the property will be asked to vacate the property immediately and will forfeit all deposits and payments. THIS IS A NON-SMOKING UNIT AND PROPERTY. Smoking is strictly prohibited in the condo, in the garage or on the condo lanai and doing so will result in full loss of security deposit & immediate eviction. The association rules prohibit any smoking on the premises if the unit is designated non-smoking. There is a bench provided outside the Na Hale O Keauhou gate for smoking. *No pets of any kind are allowed on the premises. Ocean View-180 degree view-Best in the Resort! Availability of infant/toddler Pack and Play sleeping crib. We recently spent 2 weeks in Unit C4 at Na Hale O'Keauhou. Expansive view of the Pacific and sunsets from the lanais. Yes, there are two. One upper and one lower. We ate every meal outside.Kitchen was better supplied with dishes, glasses, appliances, etc than our house at home. Beds slept well and the showers worked great. We especially enjoyed the screen on the front door which allowed a breeze to travel through the unit and avoided our use of the A/C.Finally, the owner, Stephanie, is a delight to work with. Responsive to e-mail questions and providing much information about the Big island for newer visitors.Folks, this one is a keeper! Great Condo All The Way Around! Although this review is way overdue we wanted to still have the opportunity to say "We loved this condo!" No complaints whatsoever. Stephanie has thought of everything that might be useful and make one comfortable in the true Hawaiian spirit. The condo is furnished with exceptional detail with its Hawaiian atmosphere; it was clean & well stocked with everything one might need. The location is perfect & being gated is a big plus. Stephanie was also very helpful & friendly in answering questions about our stay. We were very relaxed there. We look forward to returning someday. Thank you Stephanie & all who made a beautiful stay possible. So enjoyed staying at C-4 condo. It's a beautiful condo and had every kitchen utensil and tool that you could possibly need. There are beach chairs, sand toys, masks, snorkels and towels in the garage. We were in Hawaii for our son's wedding and a number of friends stopped by and all commented how much nicer our "home" was than the ones they had rented. Our flight home got delayed four hours and Ms. Birch was kind enough to let us stay in the condo until noon. That was so helpful because we had a toddler with us. The beach right down the street (Kahalu'u) had the best snorkeling. The grocery store right up the hill was so convenient too.I highly recommend the Heavenly Hawaiian Coffee Plantation tour which is just a few minutes away. We would stay here again without hesitation! Mahalo Stephanie Birch! My family loved staying here. The condo is laid out in such a way that we could spend time together as a family indoors or out, or retreat to our private rooms for relaxation time.The place was impeccably clean and so well appointed. We appreciated the beach chairs, snorkels, and everything else available to use at the beaches. The condo is located in a great location. Close to a grocery store, close to great snorkeling and set just far enough away to be very quiet and relaxing when you are ready.I would highly recommend this property. To begin with, the house was spotless, very comfortable and in a great location. The living space was well set up with comfy furniture and a TV with lots of channels. The bedrooms were nicely furnished with lots of pillows and blankets available. The mattresses were just the right firmness for us. But the huge difference with this home is how well stocked it was. They had every imaginable beach accessory/toy with lots of beach towels which is very important when you rent a beach house far from home. The owner and local manager were very quick answering any questions we had and were very nice to deal with. We never used the pool as we prefer the beach but it looked very nice. The location is off the main road so quiet and no traffic but very close to shopping center and all local sights and activities. Would stay here again on our next trip to Hawaii. Everything you need for a home away from home!! The house was immaculate and had lots of room for the six of us. The snorkels and masks were good, but you will need to get some flippers. Really close to shopping and the nearest beach is just down the hill and around the corner.We kept the windows and doors open when we were home and didn't need to use the air conditioning at all. When renting this place let them know ahead of time that you won't need the AC.We would definitely stay here again. We thoroughly enjoyed our stay at Na Hale O Keauhou Townhome C-4. This is our second stay within this community and the first stay in this unit. This unit overlooks the community swimming pool and hot tub with a view of the ocean in the distance. The townhome is two stories with a tiled downstairs living, kitchen with granite countertops, dining room and powder room areas. The upstairs is carpeted with three bedrooms, two full baths, and a full size front loading Whirlpool washer and dryer. The unit is clean and very quiet with good central air conditioning. We found that this unit is VERY well stocked in the kitchen, allowing us to prepare our meals with all the necessary cookware and utensils. The bathrooms are also well stocked, including a variety of shampoo and conditioners left by previous guests. The garage is stocked with beach chairs, boogie boards, sunscreen (left by previous guests), and beach bags. Pros: Clean, well stocked, beautiful views, washer / dryer, quiet location, shopping center & movie theatre nearby, great value for the price. The community is beautiful and meticulously maintained. Amazing ocean sunset views. Nice community pool and spa with exercise weight room. Cons: Only one floor lamp for the entire living room and dining room area. Lighting downstairs comes mainly from three ceiling fans. Some traffic noise from Alii Drive when sitting on the Lanai or when the sliding glass doors are open. Recommendation to owner: Dishwasher should be replaced as it is not in good condition. Replace downstairs ceiling fans with something more modern or with an island style. Add end tables and lamps. Summary: I strongly recommend choosing this townhome and would choose it again for the amount of square footage, location, and amenities. This condo was very clean and had everything that we needed for our vacation. The view was fantastic and the complex has always been on of our favorite places to relax in Hawaii. If we are fortunate enough to have another trip to the Big Island, we will be staying here again! This was our 35+ time going to Hawaii in the past 25 years. We primarily go to the Big island or Kauai. We have stayed at many different high - end resorts, and Na Hale O Keahou unit C-4, ranks #1 on the Big island! You want for nothing. It is well equipped from kitchen supplies to soaps and hair products to after sun products. It is an absolutely beautiful townhouse that is extremely comfortable with a breathtaking view and close to necessities. We thought so highly of it that we booked it again for next year before we left. We had a wonderful stay at Townhome C-4 during from 12th to 19th April 2017.We are friends from University and joined Scuba Diving Club, and first visit with them to the big Island.First of all we are surprised the wonderful view from Lanai and thought that C-4 is the best view within other townhomes.Also good and clean three bed rooms and large kitchen gave us good healing time compare with other condo which are kona coast resort and country club vila near the townhouse.Therefore we had a good stay with outing to Kirauea, Mauna Kea ,Wicoroa villege, kairua kona,Thunder mountain coffee, Mauka Meadows Coffee farm.And swum at Kahaluku beach and White sand Beach.Thanks very much owner and administrator and workers at Na Hale O Keauhou and see you soon. We were on the Big Island March 15-28th with our family of four including two teenagers. This accommodation was perfect in every way. This was our second time staying in this complex and our first time staying in unit C4. The complex is quiet, family friendly, we'll run and in a great location. Walking distance to a great snorkelling beach, a grocery store and Keahou Bay. Also easy to get onto the highway if you are heading out for a day trip. Unit C4 had everything we needed for the beach (towels, chairs, snorkelling gear, water shoes, cooler, boogie boards, ice packs) and a fantastic drying rack in the garage. The kitchen was well stocked with spices and every type of dish we needed. They even had Saran Wrap and ziploc bags. The photos don't do this place justice. It is large, bright, and beautifully decorated. The views are amazing and better than we expected. I would say this is probably one of the best appointed units in the complex. When we return to the Big Island we will most definitely try to stay in unit C4 again! The best part of our trip was renting bikes and riding through the lava fields to see the volcano spurting into the ocean. We are grateful to Stephanie for suggesting this wonderful adventure! Simply, we had a delightful stay! So nicely appointed and furnished in a comfy Hawaiian style. Everything needed for the beach is there and ready to go - beach chairs, boogie boards, coolers, snorkel masks and fins. The location can't be beat - just minutes from several snorkeling areas and the ocean views from the condo are panoramic and spectacular. Very convenient to the pool and fitness center. And, just a short walk to the Keauhou Shopping Center offering several fine restaurants, food and drug stores, urgent care. The kitchen offered all one needs to prepare a gourmet meal + a large lanai with BBQ and comfortable table and chairs. The internet was fast and worked flawlessly. The cleanliness could not have been better - all meticulously maintained. We've already made our reservation to return. PS - Stephanie, we enjoyed the fruit basket - it added a warm and welcoming touch! Thank you. A beautifully appointed condo with perfect sunset ocean views. This condo has all the amenities to make you confortable in a home away from home. A convenient touch is that there are beach mats, towels, chairs, cooler, boogie boards and snorkel gear to make a trip to the beach an easy endevour with all you'll need! We stayed for about a week. There was a nice fruit basket with some yumminess that we enjoyed. The A/C worked great (which we'd had an issue with at a different place a previous time). Wifi worked well for our down time and with morning coffee (and there are a few board/card games). The view is very nice (particularly from the upstairs balcony). The garage is stocked with several things for the beach (which we missed, even though it is in the folder). Perfect location! This condo has a great view: you over look the pool so you can keep an eye on older kids and have a fantastic ocean view. The kitchen is equipped with small appliances, napkins, paper towels, and spices. The bathrooms have soap, shampoo, and conditioner. There are boogie boards, beach chairs/umbrellas, and coolers. The laundry room has detergent and dryer sheets. If you have ever stayed in Na Hale O Keauhou, you know that you may need to purchase or rent some of the items mentioned. It was a pleasant surprise to find this condo so well equipped! There is tv and internet. We loved this unit and hope it is available for our next visit! Mahalo!! The condo was everything we could ask for and more. Boogie board, chairs, umbrella, kickboard for the beach. Plenty of towels. Googles for the beach and pool. Everything was in tip top shape. The unit was clean and organized. The bathrooms were great. Really nice master bath!The kitchen was stocked with everything. High quality food storage boxes. And plenty.Even tote bags were available for groceries and sundries for our daily excursions. The pool was wonderful. The condo we chose and the conversations with Stephanie made our stay so easy. Thank you again for owning and renting out such a nice place. Very easy to rate 5 stars. The condo is perfect: tasteful, super clean, amazing view, ideal location and so comfortable.We had a wonderful time, minutes from the best snorkeling, magic sands beach and necessities. We will be back! Thank you so much for sharing your place with us. This was such a great surprise! This is a top of the line condo, stocked with everything a family could every need. The furnishings in the condo were top notch. The entire condo is beautifully designed and decorated. We were very close to the pool but had just the right amount of distance. Six of us were in the condo and we all had enough space without feeling cramped. The owners have gone to great lengths to make sure this condo is clean, stocked with supplies, and your home away from home. You feel as though you are in a luxury resort! It is very close to shopping and restaurants and an easy drive to downtown Kona, should you want to watch the sunset from a bar or restaurant. The views from the condo are spectacular and the you can cook or grill with ease. We will surely go back and we will recommend this to all.